Web visitors can now assess the performance of in-house or outsourced telemarketing services in less than five minutes—for free. 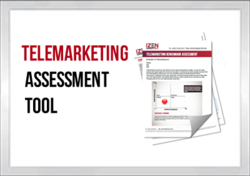 IZEN Marketing Limited, providers of telemarketing services to business-to-business customers worldwide announced the availability of their complimentary, online telemarketing services assessment tool. Developed by a panel of leading telemarketing, sales and lead generation experts, IZEN’s assessment tool, helps companies to quickly and easily assess the performance of their telemarketing programs to identify opportunities where they can gain significant improvements. Visitors who complete the short and confidential online assessment receive their own personalised report, benchmarking them against industry best practices. The tool asks a series of questions and visually plots a respondent’s current performance on a benchmark grid. In addition the report makes recommendations on those factors that will contribute to greater efficiency and effectiveness of the telemarketing spend, allowing companies to achieve higher return on investment and even greater sales success. Now sales and marketing can rate the performance of their telemarketing programs against best practices from companies who commission telemarketing services from external agencies, conduct telemarketing in house, and those that adopt a blended approach of both models. Because the recommendations will differ according to the specific responses, visitors can also benefit from repeating the assessment again at a later stage, to evaluate the progress they have made and to investigate additional factors they can consider as they seek to drive even further enhancements. IZEN Marketing delivers results-led business-to-business telemarketing and lead generation services to an ever growing list of clients across the globe. The company has delivery centers covering the UK, Central and Eastern Europe, EMEA, Asia-Pacific and Central and Latin America with a 2,500 global seat capacity of multi-lingual, native speakers for inbound and outbound calling. The company’s services span the full marketing and sales cycle from lead generation to close, guaranteeing returns at every stage.